Las Vegas Getting ready to party hard on New Year's Eve? There's tons of stuff to do, and if you're gonna get wild to celebrate 2016, you'd better have a good recovery plan come New Year's Day. It's one of the most popular times of the year to grab a good brunch... and every good brunch deserves an awesome bloody mary. Here's a look at 18 of the best ones in Las Vegas. As the longest bar in Nevada, the aptly titled Longbar stretches the entire length of the casino, with tons of flatscreen TVs and plenty of go-go dancers nearby. 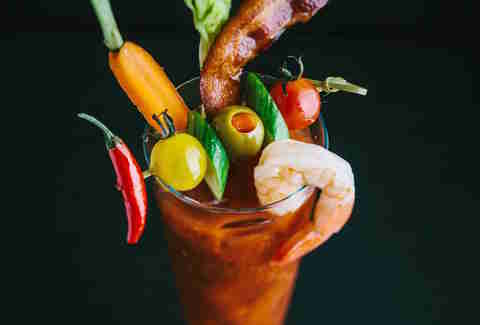 From 9am-2pm on Sundays you can design your own bloody mary, with five choices of mix (from traditional to tangy), a wide array of liquor (from vodka to gin) and choices of add-ons (from fresh celery to pimiento olives). 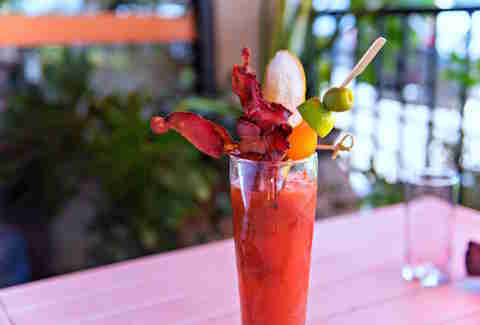 Even better than the patio seating on the Strip is the bacon bourbon mary at Tom's. It's made with Jim Beam that's infused for 24-hours with real bacon. The fat is then drained out and the savory leftovers are blended with an in-house tomato mix and topped with olives, lime, bacon, and celery smeared with cream cheese. Need to go big? 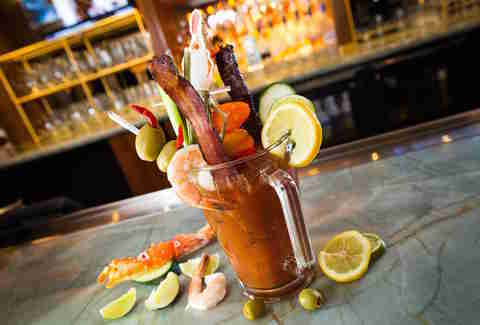 The Colossal is a mini-pitcher loaded up with organic basil-infused vodka, bloody mary mix, jumbo shrimp, alaskan king crab leg, bacon, a beef stick, peppers, and pickled vegetables. It sells for $38 every Saturday and Sunday 7am-1:30pm. 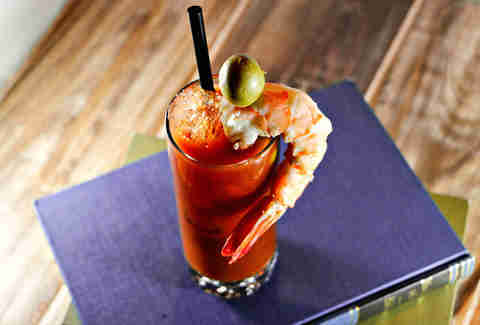 The Yardbird bloody mary is a classic recipe with a southern touch. 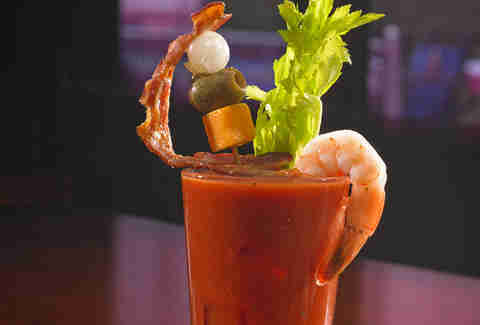 The vodka is blended with a house-made mix and garnished with bacon, okra, green beans, lemon, and olives. It's the perfect thing to wash down Yardbird's signature fried chicken with watermelon and waffles. The Ultimate Bloody Mary mixes Chopin Potato vodka with locally produced Habla Diablo bloody mary mix and comes garnished with a shrimp kabob made with a jumbo cocktail shrimp, olive, cocktail onion, aged cheddar cheese, and a strip of bacon. A fresh piece of leafy green celery is thrown in so you can at least pretend it's healthy. The Lobster Mary. Just because it's garnished with Old Bay and a tender Maine lobster claw. There's a popular bloody mary cart on weekends with almost too many options to count, but if you want to combine your cocktail with a meal, get the All About Mary. 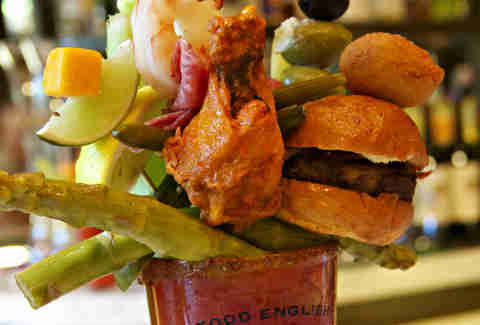 Check this out for garnish: salami, cheese, corn dog, cheeseburger slider, chicken wing, stuffed olives, pickled green beans, and asparagus, all for $35. The bacon-infused vodka is blended with a house-made bloody mary mix and fresh tomato water while garnished with soppressata, fontina cheese, and artichoke. It's the perfect weekend drink alongside the four-cheese Quattro pizza. The Jamaican influence is felt not only in the food but also with the cocktails at this longtime locals' hangout. New Amsterdam vodka is combined with jerk-spiced bloody mary mix and garnished with lime, heirloom tomato, habanero olive, pickle, and house-made jalapeño bacon. A bloody mary with a French twist. Try their bloody mary or maria (either vodka or tequila) while enjoying the views and weather on the patio. The drinks are custom made from a cart table-side during the Saturday and Sunday brunch, all with fresh ingredients. You've got three options for the "Bloody Hell" bloody mary: The Big & Smokey with black grouse, lime, A1, and horseradish... the Cerdo Picante with spicy bacon-infused vodka, fresh lime and shrimp... and the Bitter Hottie with IPA, Sriracha, lime, celery bitters, and a salted rim. Choose wisely. House bloody mary mix loaded up with a fresh tomato wheel, smoked bacon, a rib of lettuce, and white toast on the side serve to remind you that it's breakfast (maybe). It also comes served in a 20oz glass with a requisite salted rim. This Mexican joint specializes in organic, healthy ingredients (and the bloody mary is no exception). It combines vodka, organic tomato juice, Worcester sauce, Tabasco, salt, and pepper in a glass lined with chili salt, with a lime, olives, jalapeño, and celery as the garnish. Some people simply want tequila instead of vodka, especially when you're loading up on tacos and tostadas. 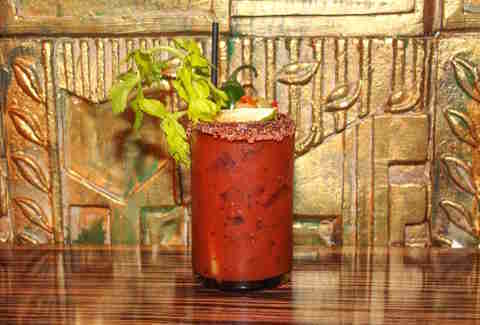 This bloody maria comes with Jose Cuervo, fresh cucumber, Chipotle Tabasco, olive juice, and a salted rim. Need more ridiculous examples of garnish? Read on. 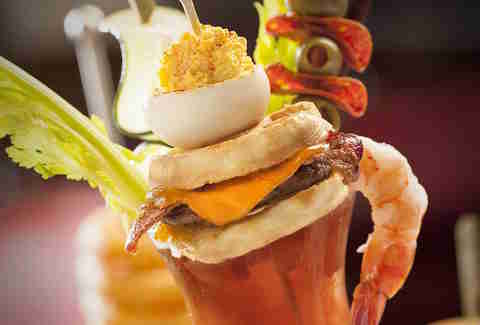 The bloody mary at this 24-hour spot is the perfect symbol of Vegas indulgence with Belvedere vodka, spicy tomato, shrimp cocktail celery, a Slim Jim, beef jerky, deviled egg, waffle slider, pickle spear, horseradish, and lime. The bloody mary from mixologist Wendy Hodges has a spiciness that's based on flavor rather than temperature -- due to a secret 13-ingredient mix, fresh house-made horseradish, olive juice, crushed red pepper, and vodka infused for a minimum of two weeks with celery and peppers that include bell, yellow, red, orange, serrano, jalapeño, and poblano. 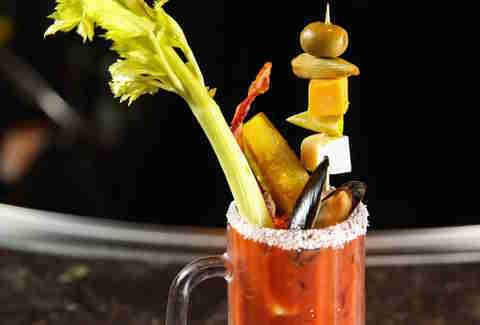 This Bloody Mary is made with precision and to your liking, almost like a steak. The cocktail here comes with a choice of five liquors (Grey Goose, Patron, Stoli Jalapeño, Absolut Peppar, or bacon vodka) mixed with three levels of heat, 20 sauces, cucumber, pickles, asparagus, cherry tomatoes, lemon, lime, olives, prawns (! ), bacon, celery, carrots, pickled jalapeños, and peppers. 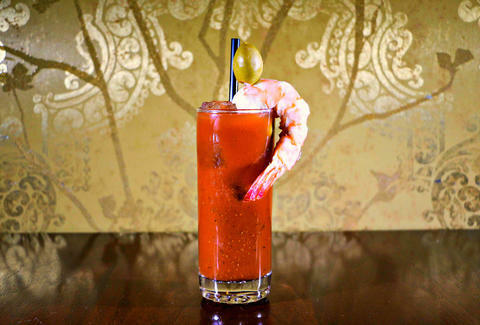 Why settle for bottle service at the club when you can have Bloody Mary service at brunch? The table-side cart is all yours for $70. It comes with two 750ml bottles of 50 Bleu vodka, jars of garnish, and two choices of bloody mary mix (one being just a little more spicy than the other). Rob Kachelriess is the Managing Editor of Vegas2LA Magazine and a News Producer for KVVU FOX5 in Las Vegas who prefers a cheeseburger slider as the garnish for his Bloody Mary. Follow him on Twitter @rkachelriess.